Wondering how to film and edit compelling 60-second videos? Want your videos to boost social media engagement? To explore how to create short videos for Instagram and Facebook, I interview Lindsay Ostrom. 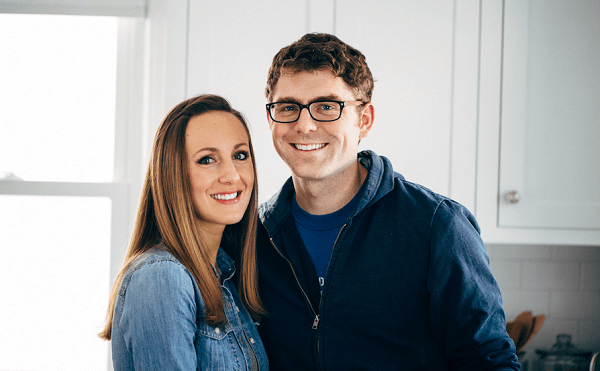 In this episode, I interview Lindsay Ostrom, founder of PinchofYum.com and author of the Tasty Food Photography ebook. She also co-founded Food Blogger Pro, a membership site for developing and monetizing food content. Lindsay explains why short videos work and how to create a hook that captures viewers’ attention. You’ll discover tips for lighting and editing your videos. 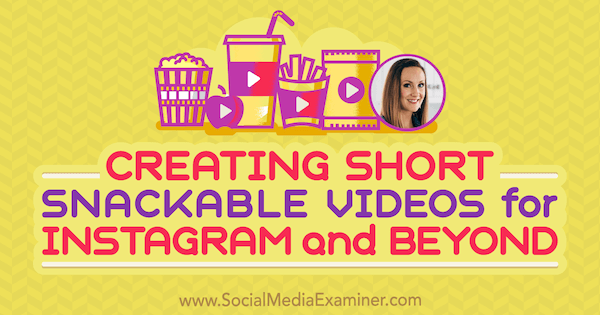 Creating Short, Snackable Videos for Instagram and Beyond featuring insights from Lindsay Ostrom on the Social Media Marketing Podcast. Lindsay began her career as an elementary school teacher. She taught fourth grade and loved it. After school, Lindsay liked trying different things in the kitchen and started a food blog as a hobby. Lindsay enjoyed creating the recipes, and the game of seeing how many followers and comments she could get. Even in the early stages, she liked digging into the analytics. The blog started in 2010, and after a year, traffic continued to pick up. Then Jane Wang, the mother of one of the founders of Pinterest, pinned one of Lindsay’s recipes. At the time, Jane Wang had one of the most followed accounts and her pin was a lucky break that led to a spike in the blog’s growth and led Lindsay on the path toward blogging full-time. Eventually, Lindsay and her husband both left their day jobs to work on Pinch of Yum. They now also have a team of five people. Lindsay and Bjork Ostrom run PinchofYum.com and Food Blogger Pro. The majority of the content is, always has been, and probably always will be food and recipes. The blog posts include several pictures, the recipes in text, and videos. The blog has a lifestyle side too. Once or twice a month, if something significant happens in their lives, Lindsay talks about it on the blog, although not in a recipe post. The rest of the content is food with personal stories woven into them. Pinch of Yum has about 124,000 followers on Pinterest; 270,000 on Facebook; and 466,000 on Instagram. Listen to the show to hear what Lindsay calls the “funny/embarrassing” part of her blog’s growth story. What Are Short, Snackable Videos? Short, snackable videos are around 60 seconds long and typically show only someone’s hands as they create a recipe. These videos are like a bridge between a photo of a recipe and a full-blown cooking show. Tasty, which most people are familiar with, deserves a lot of the credit for popularizing this style of food video. Enjoy a meatball sub without all the mess with this easy meatball sub recipe ! These videos are frequently shot from an overhead angle. When Lindsay creates her videos, she wants to make people feel like they could be in the shoes of the person cooking. The videos provide an intimate but quick look at how a recipe works and why certain ingredients work together. A snackable video differs from a longer type of food video in both the way the info is given and the way people consume it. For example, a YouTube-style video about how to grill a steak might be five minutes long, and someone might talk about how to choose the best cuts of steak, what temperatures to use, and other specifics characteristic of a deep dive. Snackable videos, like the ones Pinch of Yum produces, are short and have a narrower focus such as a good idea for dinner or some tips and tricks. Lindsay’s videos label ingredients with text, but the text doesn’t include specific amounts. The videos move so fast people can’t read a ton of detail. If a video shows ingredients going into a blender, the video might display text such as “banana” and “orange juice” as those ingredients go in. I ask about the number of views these videos receive. Lindsay answers that over the past 5 to 6 months, they’ve averaged somewhere above 200,000 views per video on Instagram, which is Pinch of Yum’s strongest platform. People view, share, comment, and even save the videos. On Facebook, the videos get between 25,000 and 50,000 views. On YouTube, the views are even lower. NO KNEAD BREAD! Crusty outside, soft and chewy inside – perfect for dunking in soups! However, Pinch of Yum’s videos aren’t optimized for YouTube. As soon as they post a video, it gets around 1,000 views. As time goes on, the YouTube videos, which are embedded in the blog posts, accumulate views through the blog and YouTube search. Their Instagram videos almost instantaneously hit a minimum of 100,000, but their average is more like 200,000 views within the first two days of posting. Listen to the show to hear Lindsay share how many views her videos have received when they go viral on Facebook. People’s brains process images faster than text, and communication is at the heart of the videos’ effectiveness. Understanding a recipe via this type of video is easier than reading the recipe because videos communicate how a recipe works visually. In other words, the videos are the fastest, most efficient, and most enjoyable way for people to consume the information. Lindsay thinks the videos work because their visual nature matches up with how our brains want to process information. The audience can see and understand the recipe instantly. Also, although Lindsay’s videos include a music track, you don’t need the audio to understand the recipe. You can watch the video silently in your feed. I ask whether people click to see the full recipes because the videos don’t include measurements for each ingredient. Lindsay says clicks are more common on Facebook because that behavior is built into the platform. Facebook users often share links to news articles and blog posts, which you need to click to see, and in the same way, those users are likely to click to see a recipe. On Instagram, however, people interact with content differently. Thus, on Instagram, Lindsay focuses on creating as much value as she can within that platform. For a recipe video, Lindsay includes the amounts in the caption or in her Instagram stories. Providing all of this information so users don’t need to leave the platform has been a successful strategy. To monetize Instagram, Lindsay has found that the more attention you get on your channel, the more brands want to pay to be in front of your followers. Over the past year, more of the blog’s sponsored content has shifted to Instagram. In the past, most sponsored content appeared on the blog and an Instagram video was content that went above and beyond the blog. 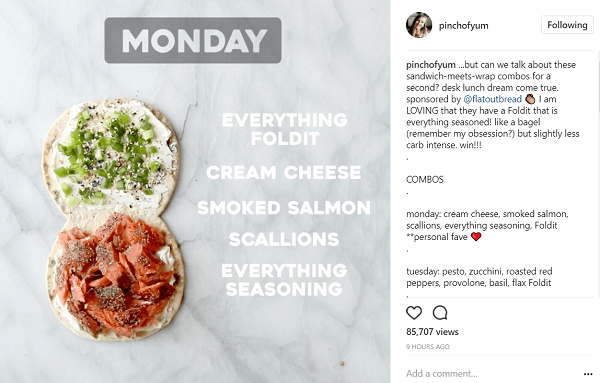 However, as Pinch of Yum’s Instagram following and engagement have grown, brands come to Pinch of Yum solely for an Instagram post. Lindsay develops recipes and creates videos for specific brands that never even see the blog. Although these Instagram-only sponsorships aren’t quite as significant as sponsored content on the blog, the Instagram-only content has become its own pillar in their business model. 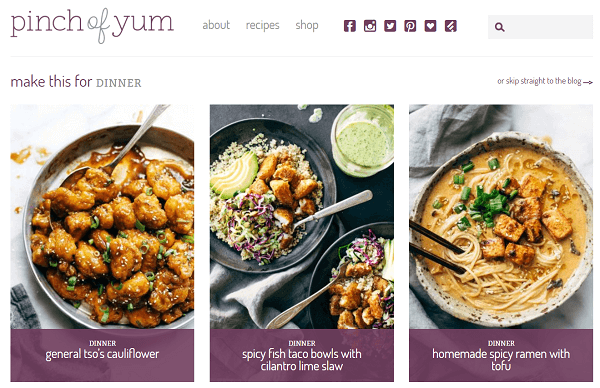 Pinch of Yum creates recipes and videos for brands. I ask whether anything that’s a process can be made into a 60-second video. Lindsay says recipes are the most popular, but craft, fashion, and home-related topics also work well with this video format. Brush-lettering and calligraphy videos show someone writing their beautiful calligraphy at hyper-speed. In this case, the videos don’t share a tip or a trick, but simply a process that’s fun to watch. Listen to the show to hear my ideas on ways to use this video format. At Pinch of Yum, the team produces about three to five videos week. A full-time video specialist does all of the recording and a shoot assistant does all of the cooking. Lindsay develops the recipes but she’s not part of the video process itself. They record two days a week, and do editing and pick-up shots on the other days. Before Lindsay had help, she created the videos herself. A lot of people feel like they can’t create videos because they don’t have a team or aren’t ready to hire someone. But everyone has a smartphone, and smartphones are amazing for producing videos. Moreover, valuable content matters more than video quality or format. For instance, in about three hours, Lindsay recorded a chocolate chip cookie video on her phone and then edited it. She included the video in her blog post and uploaded it to YouTube. Over time, this 60-second phone video, which she put together on a whim, has gotten half a million views. Although a really polished format is great, Lindsay thinks a video with good content (even one shot and edited on your phone) is better than no video. Listen to the show to hear Lindsay discuss the quality of the first videos she created. When Lindsay records videos with her smartphone, she uses the built-in camera and a program called Reflector 2. If you’re recording overhead video (for food or another topic), whether your phone’s on a tripod or positioned some other way, it’s difficult to see what’s on the screen. Reflector 2 mirrors what’s on your phone to your computer. Lindsay finds it helpful to see how her video looks on her laptop while she’s recording. The basic editing software Lindsay uses is iMovie, which is iOS-only and comes standard on iPhone. For this overhead quick style, the basic software is enough because you mostly need the ability to cut and splice clips and speed up the video. 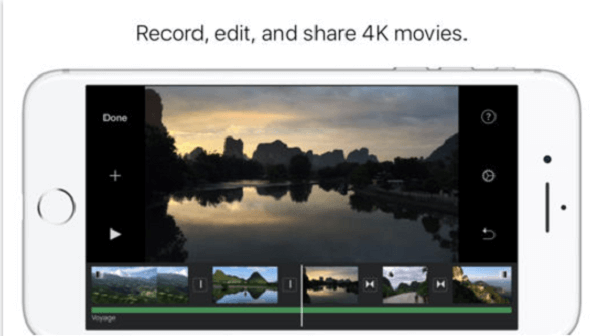 Use basic software such as iMovie to edit videos. Above and beyond a smartphone, Lindsay and her team use different Canon DSLR cameras. Plus, they have a wide-angle lens for the overhead shot and a telephoto/macro-style lens for close-ups from the side. When they have a full setup, they record two angles simultaneously. The overhead angle shows the overall scope and scene of the table. About 75% of the finished video comes from this overhead footage. For certain “beauty shots” of the food (a sauce going over the top, a big bite of noodles being pulled out with chopsticks), a close-up side angle shot helps viewers feel a bit more involved with the food and get a better sense of what the final dish is like. Basically, the overhead shot shows the method, and the side angle shows details. You can use two different cameras or the same one to shoot (just repeat the process). Tripods, Lindsay says, are the bane of their existence, which is true for a lot of food photographers. Their office is in an old, refurbished warehouse building, so the floors shake. A regular tripod setup with an arm attached to the top allows them to point the camera straight down. A bag of rice or another heavy thing on the other side of the tripod arm helps keep it balanced. For lights, Lindsay recommends a window, because she prefers to use natural light. Light from a window is okay if it’s sunny or cloudy but can be tricky on partly cloudy days because the sun keeps changing. Lindsay wanted to use natural light to create continuity from the photography to the videos so both reflect Pinch of Yum’s branded style. Natural light is also important to Lindsay because she wants the photos and video to look like someone’s sunny kitchen, not a random studio. Pinch of Yum occasionally uses lighting equipment for photography or video when the weather puts them in a bind. They have a couple of tabletop lights from Lowel with bulbs that are daylight-balanced, so they don’t look too yellow or blue. The bulbs are supposed to simulate natural light. Lindsay prefers natural light for Pinch of Yum’s photos and videos. When shooting, Lindsay and her team tend to capture more footage than they need. They want things to look just right. Lindsay says people would likely be surprised to learn how many times they film pulling up noodles with chopsticks. Also, when a step in a recipe doesn’t look quite right, they’ll remake the recipe the next day and film only a specific portion. They just need to make sure the details match in terms of the time of day, the props, and the hands in the video. Listen to the show to hear Lindsay discuss why a camera might jiggle while filming and how they manage that problem. For a process-based video, people don’t necessarily need to see every step. To illustrate, if you have a cut-up apple, viewers will understand that you cut it up. They don’t need to see you cut it unless you do so in a special way. The same could be true about something craft- or gardening-related. Also, speed up your video because people can process information quickly. Don’t go so fast that the video makes them dizzy when they watch, but you can increase the speed a little bit. Lindsay says Pinch of Yum videos usually go between 2x and 4x speed. However, for beauty shots, such as frosting dripping down the side of a cake, they slow down the speed to create a dramatic, emotional effect. I ask how Lindsay and her team plan their videos. Lindsay says that in the beginning, the team would meet and write out the shots, transitions, and details. Now, the flow of their videos is second nature, and that’s how they think. Every once in a while, they have a bigger project, such as lunch for every day of the week, which requires thinking about the story they want to tell. Lindsay refers to our recent podcast with Jeremy Vest, where he talks about how videos need to have a hook, a purple cow, or something interesting or different. Lindsay thinks that point also applies to a food, craft, or how-to video. For example, some of Pinch of Yum’s most popular recipe videos start not with the first step in the recipe, but with whatever’s most interesting to watch. For instance, a video of a chocolate cake starts with Lindsay rolling the frosted cake in chocolate chips. Making the cake was not that interesting, so beginning with the shot of a huge chocolate cake literally rolling into a pan of chocolate chips created a hook or preview. Then the video backed up to explain how to make the cake. Pinch of Yum used to end videos with their URL. Now the end card on Instagram says “Follow @PinchofYum for more recipes.” They changed the call to action because people watching the video may not be followers. Others frequently share Pinch of Yum videos or they’re featured in a Discover More section. The new call to action tells viewers where to go for more. Listen to the show to hear Lindsay explain how to keep a hook or preview short but still clear to the viewer. Plotagraph is a cool app that animates images with magical effects. You can use Plotagraph to create a looping video, animated GIF, or animated PNG. Then upload your eye-catching image to various social media platforms. When you look at the examples on the Plotagraph website, the image effects kind of blow your mind. Plotagraph adds magical effects to your images. Most of the time, you make looping videos or animated images from a video. However, Plotagraph begins with a still image and creates the movement with what appears to be CGI effects. You can upload an image to the app or website, or take a photo inside the app. In the Plotagraph app or website, you mask the portions of your image that you want to remain still. To create the mask, draw lines on your image. Then move points on those lines to refine the mask. When you’re done, Plotagraph adds movement to the unmasked area. 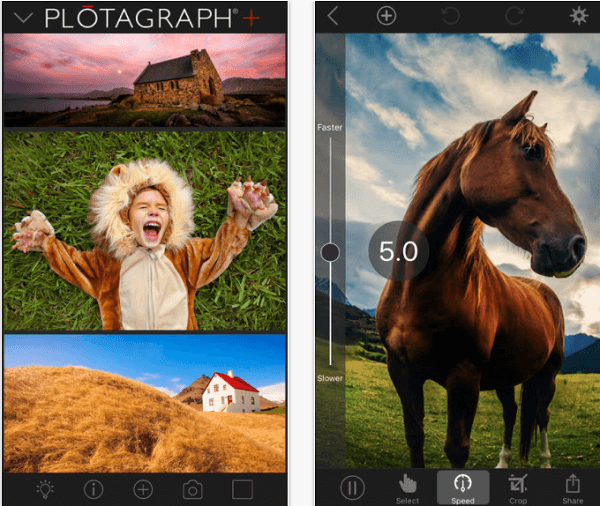 Plotagraph is available via the web for free and the iOS app costs $4.99. Listen to the show to learn more and let us know how Plotagraph works for you. Learn more about Lindsay on PinchofYum.com. Follow @PinchofYum on Instagram, Pinterest, Facebook, and YouTube. Learn more about the Food Blogger Pro membership website. Learn more about Jane Wang and follow her on Pinterest. Read the Tasty Food Photography ebook. Check out Tasty videos on Facebook. Get Reflector 2 and the iMovie editing app. Take a look at Canon DSLR cameras and Lowel lights. Listen to my podcast about video with Jeremy Vest. Learn more about Seth Godin’s purple cow. What do you think? What are your thoughts on short, snackable videos? Please leave your comments below.